SmartShepherd founders David Rubie, left, and Glenn Vassallo. THREE Australian agtech start-ups have been successful in the global AgFunder awards at the World AgriTech Innovation Summit in San Francisco this week. 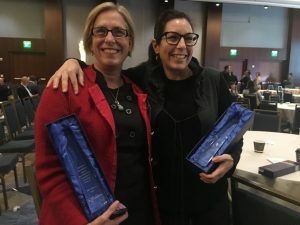 The winners of the 2018 Agfunder Innovation Awards were announced on March 20 at the World Agri-Tech Innovation Summit in San Francisco, CA. The summit is an international networking and deal-making event for agribusinesses, solution providers, entrepreneurs and investors, held annually in London and San Francisco, and attracting more than 1000 attendees from the United States, Australia, China, Europe, Israel and Latin America. This year’s focus was on new data platforms, robotics, soil health and synthetic biology. In the AgFunder awards FarmTech category, SmartShepherd was announced the Most Innovative International Startup Pre-Series A. In the Supply Chain category, The Yield and Sydney-based blockchain start-up AgriDigital won awards for the Most Innovative International Start-up Series A and Beyond. 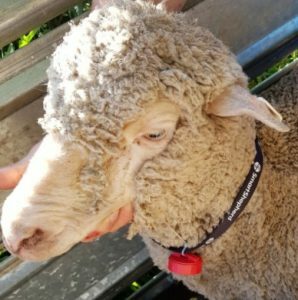 A SmartShepherd collar tag on a Merino ewe. SmartShepherd has developed wearable livestock identification technology – ear or collar tags — that can collect and analyse pedigree data. The tags transmit relationship data to enable more efficient, accurate identification of mothers and their offspring in sheep, cattle and goat operations. The technology works without GPS or internet connectivity and utilises low cost Bluetooth technology and an Internet of Things (IoT) architecture. SmartShepherd chief executive officer Dave Rubie said the AgFunder award was a bit of a surprise, although he and co-founder Glenn Vassallo have been grateful for the support received from the farming community who helped with AgFunder voting. “We have our first orders already and will be delivering to our first customers at the end of April. “We will be flat out making deliveries and doing user training over the next month while we ramp up production as the lambs start hitting the ground. The Yield founder Ros Harvey, left, with AgriDigital chief executive officer Emma Weston at the AgFunder awards. AgriDigital’s cloud-based platform provides blockchain-backed supply chain management and traceability services for the grain sector and is looking to expand into North America after achieving the world’s live settlement of a physical commodity on a blockchain system in 2016. Blockchain systems involve a digital ledger in which transactions can be recorded chronologically. AgriDigital’s platform enable grain growers, buyers and bulk handlers to track and manage invoices, payments, deliveries, contracts and inventories. The Yield provides end-to-end microclimate sensing and predictions service for land-based crops and aquaculture from Australia. Its Sensing+ system enables crop growers to monitor microclimate factors such as photosynthetic-active and solar radiation, relative humidity and soil moisture, barometric pressure, rainfall, air and soil temperature, wind speed and direction and leaf wetness to implement and forecast crop management needs. Australia’s first agtech focused accelerator program SproutX Accelerator program was a finalist in the AgFunder awards resource category, but was unsuccessful.